Back in May we started our 3rd large home renovation. At this point we have pretty much changed every room in the house, and the exterior of the house as well! By now you would think that we would be pretty knowledgeable in the home renovation space, but since the technology and innovations are ever-changing, we continue to learn something new with each project. Since I know how overwhelming the process of home renovation can be, I asked some experts to provide some helpful tips when making purchase decisions. This first article focuses on Plumbing Supplies and touches upon Kitchen Renovation as well. Thank you to Green Art Plumbing for supplying the information. Stainless steel and cast iron are the most durable. Farmhouse is the latest trending style. Consider adding a garbage disposal to reduce the amount of food waste in your garbage (and at the dump) – some models can even grind fruit pits and chicken bones. Consider your needs – pull-down is great and additions like a soap dispenser and instant-hot water/cold filtered water are useful. All can come in the same finish as the faucet for a seamless, unified look. Some models also come in touch-activated or motion-sense. You’ll want to match the faucet to the other items in the bathroom – shower trim, robe hooks, and tissue holder can all match same style and same finish. What are your needs? Regular shower head, hand shower, a slide bar that can change the height of the shower head. What are your wants? Rain shower head is nice, body sprays are a luxury option. Also, a Bluetooth shower head or vent fan can play your music while you shower. Water savings is essential – some models come with dual-flush technology that can help save thousands of gallons of water per year (they are labeled “EPA WaterSense”). Standard toilet these days is 1.6 gallons per flush (gpf), WaterSense toilets flush at 1.28 gpf without sacrificing performance. An older toilet can use between 3-6 gpf which is unnecessary. This is why it is important to update (and upgrade) your toilet. Quartz requires the least amount of care and maintenance. Granite should be sealed once a year. Marble is very porous and must be sealed several times a year. Corian and Formica are not as popular as they are easily damaged. The more options you install = the more choices you have to set the atmosphere. 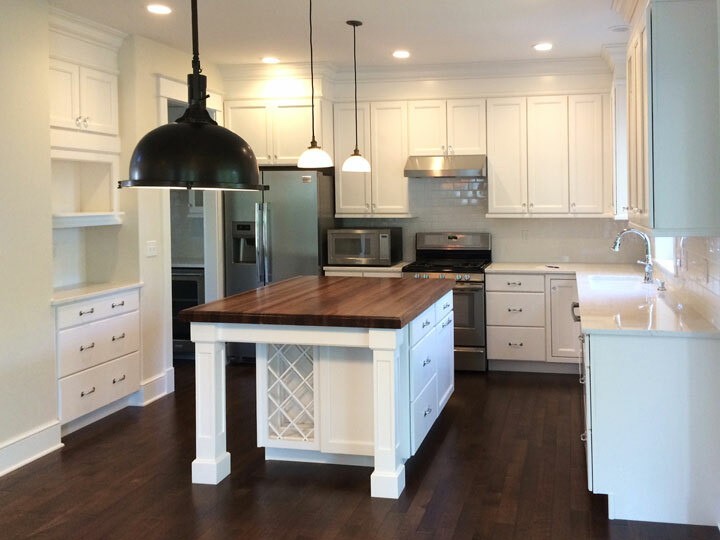 - Under-cabinet lighting is great for countertop tasks, above-cabinet makes great ambient light for entertaining, toe-kick lighting is a good nightlight, and in-cabinet can help locate items and accent fixtures behind glass doors. - New to the market: High-tech light switches, dimmers, and outlets in hundreds of finishes – includes USB ports for charging. - Because of the prevalence of pull-down and pull-out faucets, a separate spray nozzle for the kitchen sink is borderline obsolete. Use that space for an instant-hot or soap dispenser instead. 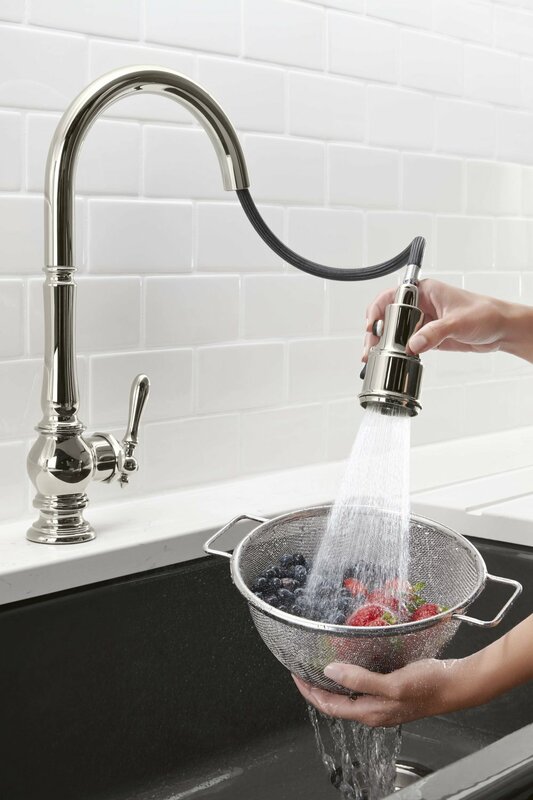 - If you don’t absolutely need it, nix the touch-activated or motion-sense kitchen faucet for a regular one. - Opt for stained cabinets instead of painted – the paint can chip over time and stain is less expensive. - Luxury items are nice, but only if you can really afford them. Things like towel warmers, body sprays, and a whirlpool tub (especially if you don’t take baths often) could be cut to make room in your budget. - Don’t splurge on rooms that won’t be seen often. 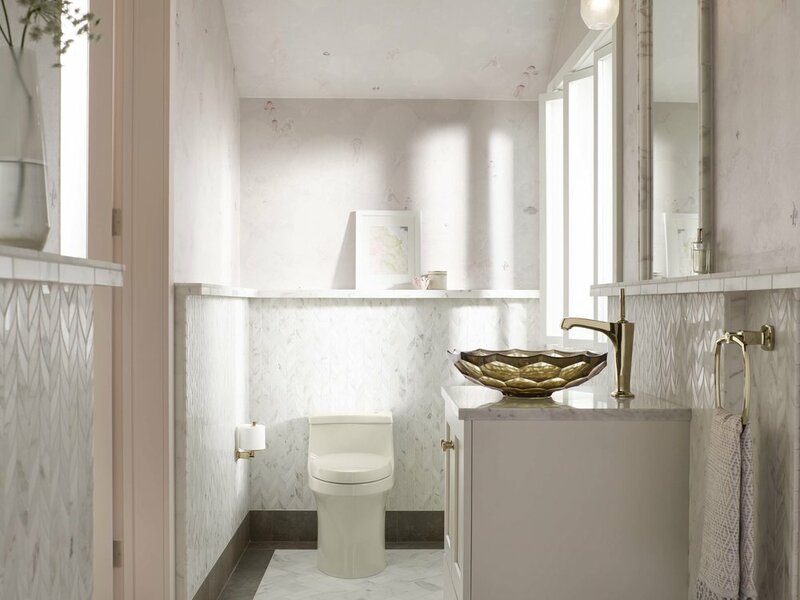 A powder room or master bath should get more attention than a guest bathroom. Plus, in a powder room there are less fixtures to match than a guest bath so why not get that super-fancy faucet and vessel sink? - A good heating system/boiler for your home (should be replaced/updated every 10 years). - A tankless water heater is great for a big family who uses a lot of hot water on laundry, showering, dishwashing, etc. More showerheads = more hot water use. - A leak detecting system can prevent damage to your home – automatically shuts off water when a leak is detected and sends an alert to your phone. - A bidet is a great addition to any bathroom. There are toilet seats with a bidet included so you don’t have to buy a whole new toilet or separate bidet basin. - A doorbell camera is a great safety feature – while you’re there or while you’re away. The sensor can tell when someone is near your front door. 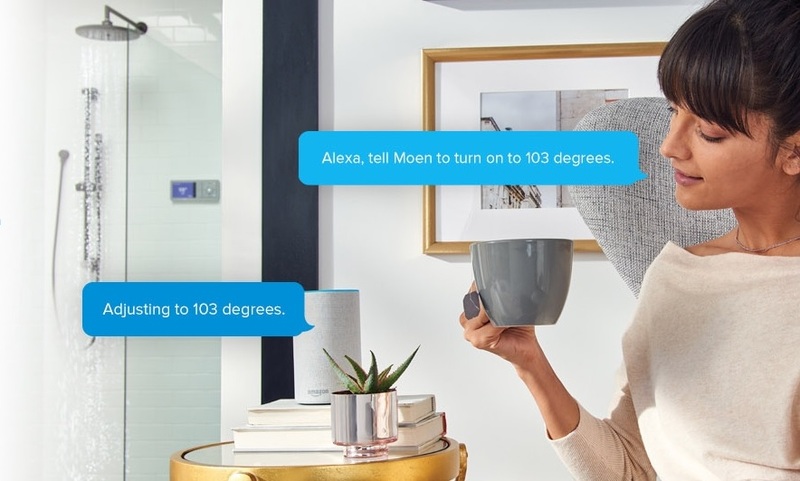 It will alert you on your phone and you can talk to the person from anywhere. - Whole-home water purification – showering, drinking, cooking, cleaning, and gardening all involves water. Know that you’re doing it safely with filtered water for your entire home. You can’t put a price on health and safety. 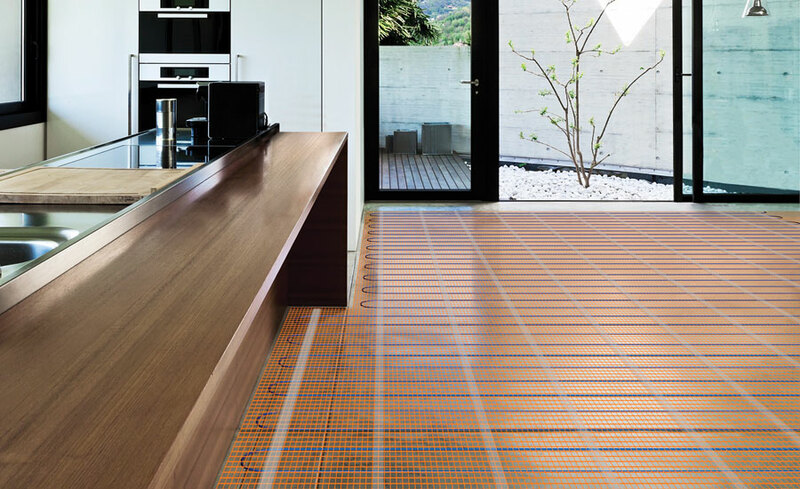 - Radiant floor heating is great for basements and underneath driveways to melt ice & snow. - You never know what’s behind the walls – you could encounter damaged pipes or electrical wiring. This could not only delay your project but also raise costs. - Adding more showering options like multiple showerheads or body sprays means you’ll be using more hot water and will need an adequate hot water heater. 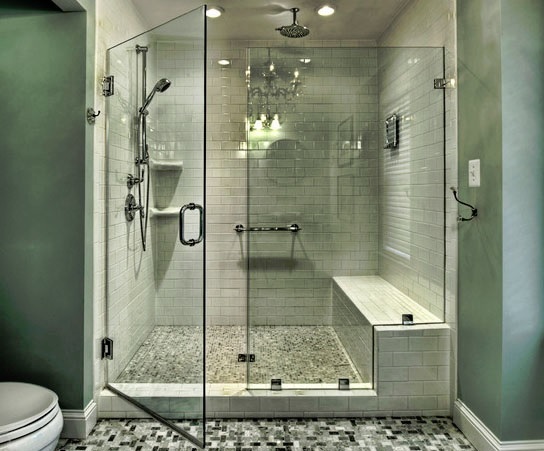 If the kids are all grown up and you never take baths, consider ditching the tub/shower combo and go with a walk-in shower. You’ll have more space and more options (rain showerhead, body sprays, bench, etc). Create a shower niche – built-in shelves for soap and shampoo bottles. Also a new trend is creating “stations” – a charging station with integrated outlets for all the family’s electronic devices, a coffee station with a coffee pot or Keurig with special drawer for K-Cups. Hope this information helps with your next renovation! I know I learned some things from doing this post! If you have any helpful tips you would like to share, please leave a comment below.